When it comes to making a plan, then you can start at any time of your choosing. Once you have started to plan, you will certainly need a calendar. While most of the people use online calendars to create any plan, we state that there are additional benefits coming along with working with traditional pen and paper as it is more pleasurable to scribble out your plan in the crisp sound of pen on paper. A calendar takes care of every aspect related to life and brings focus at one place which allows you to keep your mind free along with lesser worrying and more accomplishment. If you wish to organize your life or keep tabs on track of events or want to make a passion calendar then mentioned here are free printable calendar solutions which will certainly assist you in maintaining an overview of most valuable asset – time. If you strive to find the most accessible and easy to use calendar format, then you can use the CalendarTable website. It comes with plenty of calendar printout formats on every layout you desire. Also, you can customize your calendar with your favorite photos or quotes. Talking of templates for entire Office suite, they can be easily found in Calendar category on the page of Microsoft Office. These templates can then be downloaded to your computer, and you will need Microsoft Office or any alternative software to be opened. Microsoft Office has kept dominance in the market of text documents along with spreadsheets and slide shows for quite a long time for a fairly good reason – it remains to be very best. However, there exist only one drawback which is its price. In case you have a tight budget then try other resources. If you are looking an extensive selection of templates for any event, then Microsoft’s free online Office solution is the best place to look for. In its Calendar category, you can easily find templates for Word, PowerPoint, and Excel. One thing we wish to add to your notice that doesn’t get misled by any of the outdated thumbnails as most of the calendars are up to date and gets updated dynamically when you change the year. Office Online in a free and cloud-networked version of Microsoft Office. These calendars can be customized easily and are quite print friendly. These templates get saved to OneDrive and can be opened with Office Online. The comprehensive guide to everything related and in Excel has an extensive collection of calendar templates for both personal and professional use. These templates are regularly updated, and you can easily find out, blank, birthday or even perpetual calendars which won’t get out of date. This selection of printable calendars consists of both weekly and monthly templates in portrait as well as landscape formats with its weeks starting on Monday or on Sunday. You can certainly select output format such as Word, Excel or PDF, various type of calendar and year from the sidebar present. Then you can easily download any matching weekly, monthly or yearly calendar in simple and stylish fashion, both in portrait and landscape orientation. When it comes to simplicity of calendars, then you are at the right spot with this website. Then you have to do is choose a year or month and then press the button to print calendar. This site also provides a template which starts on Monday along with a selection of PDF and Excel templates. You can take use of Make a Calendar feature to customize your calendar template. Mint Printables comes with stylish templates for any day planner or in case, weekly and monthly calendars. These calendars are quite timeless, and their designs are among the best in the market. At CreativeMamma.com, you can easily find and download any of the best weekly planner doodle journal pages. To create your own custom monthly photo calendar, you can easily upload images either from your own computer or via the web. In case you don’t have any suitable images, then you can easily choose from a selection of few of the best inspirational templates. The calendar creator provides support to any year, start weeks on Sunday or Monday, and you can also add holidays from your own country. This is quite a handy solution in case you require a one-page yearly calendar consisting of lots of space for maintaining notes. Its import holidays feature along with printing to PDF isn’t impressive at all, but you can still print any calendar of your own choosing. This supports the creation of various monthly calendars in different formats such as portrait, landscape, business card or index card. You can also add in American holidays and also select from six type of different font colors. This assists you when it comes basic monthly templates. There benefit is that you can also create a calendar to the year 2098. 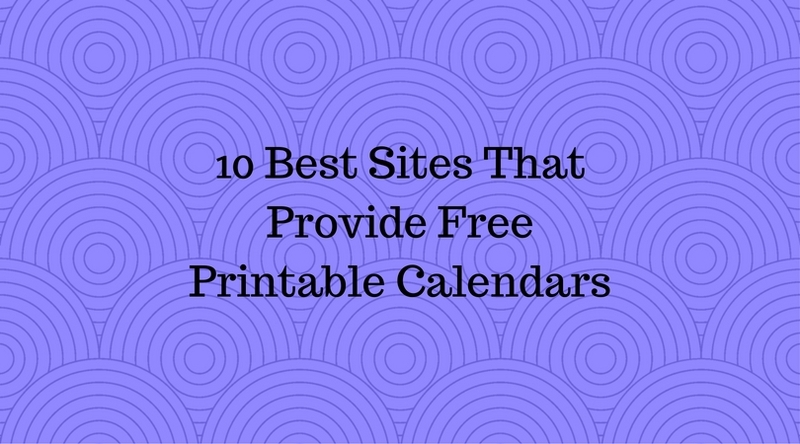 With this, we end our list of resources to print calendars free of cost. Try any of these resources, and let us know about your experience along with your suggestions and views. Mention them in the comment section below.